In this tutorial we will show you how to set up rooms that are only available (or visible) in the member areas of your site. disabled_rooms and hidden_rooms may each contain a comma separated list of rooms that are to be “deactivated” for non members. The difference between the two fields is that disabled rooms will still be visible to users in non member areas of your site- they just won’t be accessible. You add some rooms to either list by entering the name of the room you wish to deactivate. This will disable the rooms The Lobby and Help Desk. Once you have added some rooms to either the disabled_rooms or hidden_rooms list, these rooms will be inaccessible, by default, on all pages of your site. The next step, therefore, will be to activate the rooms on the member pages of your site. 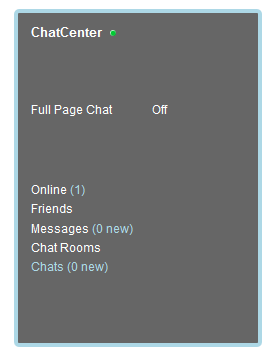 Now, FCChat does not know where your member only pages or private pages are, so you will have to “tell” it. In order to do this, you will have to go to each of your member pages and insert a little code into the page, letting the chat know not to disable the room on that page. The code must be placed on the page after the FCChat configuration has loaded. Usually, placing it before the closing </head> tag will suffice. The purpose of the code is override the hidden_rooms or disabled_rooms fields in order to remove the room from the disabled or hidden rooms list. Continuing with the example from above, let’s say now, that on a particular page, you wish to activate both ‘The Lobby’ and ‘Help Desk’. Basically, this just clears out the disabled_rooms list on that page, thereby making the rooms active again. As you can see, only ‘Help Desk’ will be disabled on this page. This tutorial will show you how to import your user profiles into FCChat. In FCChat, each user is automatically given a default profile page; however, this profile is not linked to or integrated with any external source. If you have integrated your pre-existing user accounts with the chat. (See the User Guide’s section on account integration), you may wish to link your user’s pre-existing profiles as well. In order to do this, you must edit the field import_profiles in the FCChat configuration. You will enter into the import_profiles field the url of the page that will generate the profile. The URL needs to be constructed in such a way so that the user’s name can be appended to it. The page will take the user’s name and output the user’s profile accordingly. Once you have done this, the chat will no longer use the default profile pages. Instead, when you click on profile, in the user’s dialog box, you will be taken to the page you specified in the import_profiles field. Of course, you would replace MYPHPBBFORUM with the path to your forum. When the profile is fetched, FCChat will automatically append the user’s name to the end of the URL, so that the “un=” part will become “un=USERNAME”, where USERNAME is the name of the particular user. Unlike PHPBB (unfortunately), many systems do not have a default means of obtaining the profile directly from the user’s name. In this case you must create a script which will accomplish this task. You will create the script so that it can accept the user’s name (in the querystring, for instance). Then, using that information, it will output the profile, or perhaps redirect to the profile page. The exact code required to write the script is system specific and outside the scope of this tutorial. Place the script on your site, and link to it using the import_profiles field. Again, keep in mind, when setting up the URL to your script, that FCChat will append to this URL the user’s name. 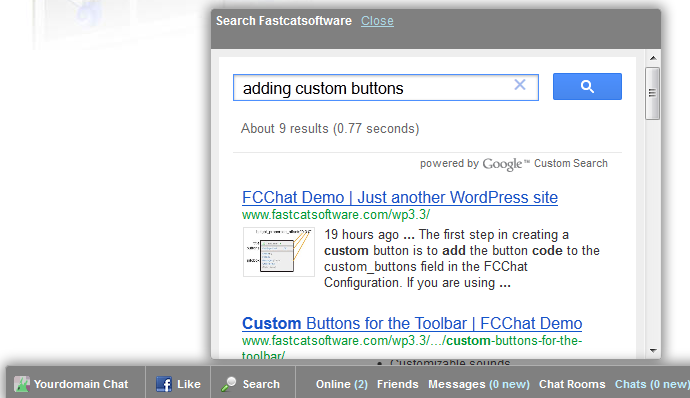 This is a tutorial on quickstyling, which is a method of customizing the FCChat widget. The purpose of the quickstyling section is to allow you to quickly change the appearance and layout of your FCChat widget, without having to edit the style templates, or use the Template overrides API. Of course, quickstyling does not offer the level of control available in the later two methods, but it should be sufficient to meet the customization needs of most sites. If you are not familiar with css properties, here’s a good site to get started: www.w3schools.com/cssref/default.asp. Offsets add or subtract quantities from the default values. The second example above would subtract 20 from the default width. width_proportion_offsets and height_proportion_offsets are special fields. They take three numerical values separated by colons. These fields allow you to increase/decrease the dimensions of the embedded widget and toolbar, as the diagrams below illustrate. Instead of going over what each individual field in the quickstyling section represents, we will provide you with some complete examples of the types of customizations you can make with quickstying, and you can use these as a springboard to create your own customizations. All the CSS properties should end in a semicolon. The background_css field is used to change the toolbar’s color and border. The shadow around the toolbar has been removed using this field. The color of text has been changed. The default color is now dark gray (#444444). Link color has been changed to blue. We have only changed the text color in this example, but you may change the size, font, and other properties as well. If you change the font size, you may find that the vertical alignment is a bit off. To correct this, change the value of text_top_offset. In addition, you may need to shift the off button over a bit. To do this, change the value of off_button_left_offset. The background_css property is used to change the widget’s color and border. The color of text has been changed. The default color is now white. Text which displays info about the state of the chat is lightblue. We have only changed the color in this example, but you may change the size, font, and other properties of the text as well. height_prop_offsets has been set to “50:50:50″. This inceases the height of the title, buttons, and infobox section by 50 pixels each. If the widget was configured for a horizontal layout (for instance, when using the template: widget_default_header.js), we would have wanted to change the width_prop_offsets instead. The image for the logo has been hidden. This was achieved by setting logo_css:”display:none;”,. Also, the title text’s left property has been changed: title_css:”left:10px;”, to compensate for the absence of the logo. frame_color is a special field, in that it does not take a full CSS property. Instead it takes a single html color or color code. Finally, you can add some styling touches to the full page chat window by editing the full_page_css_obj field. The style properties that you add to full_page_css_obj will be applied to the document body. This basically allows you to change the properties of the page background, and the style of the Welcome/Loading message. Here we are changing the background color of the page to green, and the font to 12px arial. In this tutorial, we show you how to change the url of the Full Page Chat. To use this tutorial, your must have php enabled on your site. This tutorial applies to version 3.0 and later. (and here we are using a WordPress site as the example). 1) Create a folder named chat in the root of your site. 2) Copy the file ../fcchat/html/chat/index.php to the newly created chat folder. Run FCChat as a Pop up Window. UPDATE: As of version 3.0, the pop-up window has been eliminated in favor of the full page chat. FCChat can be run as both an in-browser window, and as a pop-up window. In addition, it is posible to launch the chat directly into a popup window, when you press the “Open ChatCenter” button on your chat widget. This tutorial will show you how to use the Template Overrides API to make customizations to FCChat’s language and style templates. 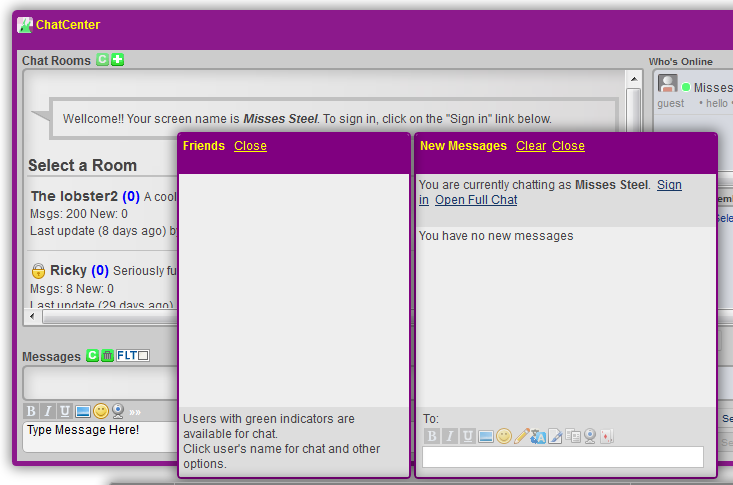 These customizations will be permanent, in the sense that they will persist from one version of FCChat to the next. For WordPress, Joomla 1.6+, Drupal 7+, and PhpBB 3+ users, the template overrides function is located in the FCChat Settings page of your dashboard. You enter your overrides in the text-box which is marked, “Template Overrides”. For all other users, the template overrides should be placed in the file global_config.js. Please read Using the Global Configuration File before continuing with this tutorial. The second thing you need to know is how to specify the option you want. We will go over that first, and then come back to the topic of using the functions above. In order to change an option within the template files, you need to determine which option it is that you want to change, and how to properly “address” that option. You will need to open up the template file, with a text editor, and examine it’s contents. The style template files are located in the fcchat/styles/ folder, and the language templates, in the fcchat/languages/ folder. Below is an excerpt from the style template: widget_default_sidebar.js. This template contains many of the styling options for the embedded widget box that appears in your sidebar. Notice that the option css has been highlighted in orange. This option controls the left/right positioning of the “On/Off” button on the widget box. The question now is – how do you reference this option in order to edit it? Now that you know how to reference the different options within a template, we will begin to talk about the 4 functions that I showed you in the beginning of the tutorial. The css option, as you can see from the excerpt above, contains quite a few css properties, but here, we only want to change the “background-color” property. mergeOption accomplishes this. When used with an option that contains a string of CSS properties, mergeOption updates the specified property, or properties, while leaving the others intact. would add 100 to the current value of the option. DO NOT use mergeOption when you simple want to replace a value, use setOption instead. Third on the list of functions is mergeBlock(obj1,obj2). mergeBlock is used to merge a whole block of options into an existing block. This option is for advanced users, or users with a strong familiarity with scripting and such. If you don’t fully understand what the merge is going to do, I recommend against using this option, because you could easily change options you did not intend to change. Also, use this function sparingly, as it makes your templates less flexible with regard to future updates. The mergeBlock function is basically just a wrapper for jQuery.extend(true,obj1,obj2), so you can refer to jQuery’s documentation for more info about the merging operation. Lastly, there is the getCSSProp(option,prop,[true]) function. This one is used to retrieve a single property from an option containing a string of css properties. The function, as used above, would return the value of the “background-color” property. If we go back to the excerpt in the beginning of the tutorial, the value returned would be “gray”. The optional third argument of the function, when set to true, tells the function that we are requesting the numerical part of a property, like “10px”. This would return 5. Without the true part, the function would return “5px”.